Vacancy announcement from Pashchimanchal Development Bank Ltd.
Pashchimanchal Development Bank Ltd. is a leading regional development bank, which head office is based in Butwal,Rupandehi. The bank seeks applications from efficient, hard working and dedicated Nepalese citizens to place them at the head office and branches. • Minimum Bachelor's Degree, preferably in Management. • Computer literacy with good working knowledge. • The applicant should not cross 40 years of age as on 9th July 2015. 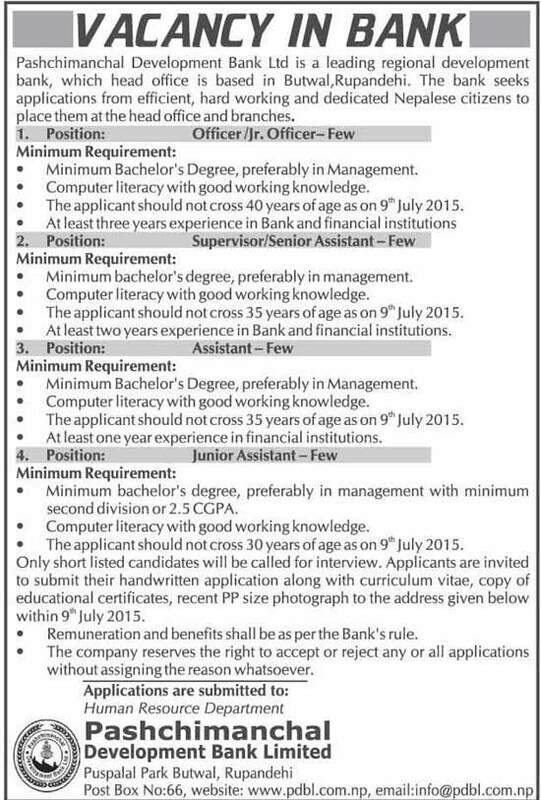 • The applicant should not cross 35 years of age as on 9th July 2015. • At least two years experience in Bank and financial institutions. • At least one year experience in financial institutions. • Minimum bachelor's degree, preferably in management with minimum second division or 2.5 CGPA. • The applicant should not cross 30 years of age as on 9th July 2015.